Top L to R: Pasta with Fresh Tomato Sauce, Sweet Corn Agnolotti with Mushrooms, Parsley Pesto Spaghetti. Middle L to R: Modernist Mac & Cheese with Bacon and Roasted Cauliflower, Roasted Tomato Risotto, Bolognese-Style Lasagna. Bottom L to R: Farro Bowl with Sugar Snap Peas and Kielbasa, Sausage-Zucchini Pasta, Multi-Grain Risotto with Broccolini and Brussels Sprouts. My lists of the year's best cocktails and salads, soups, starters and sides were pretty lengthy. 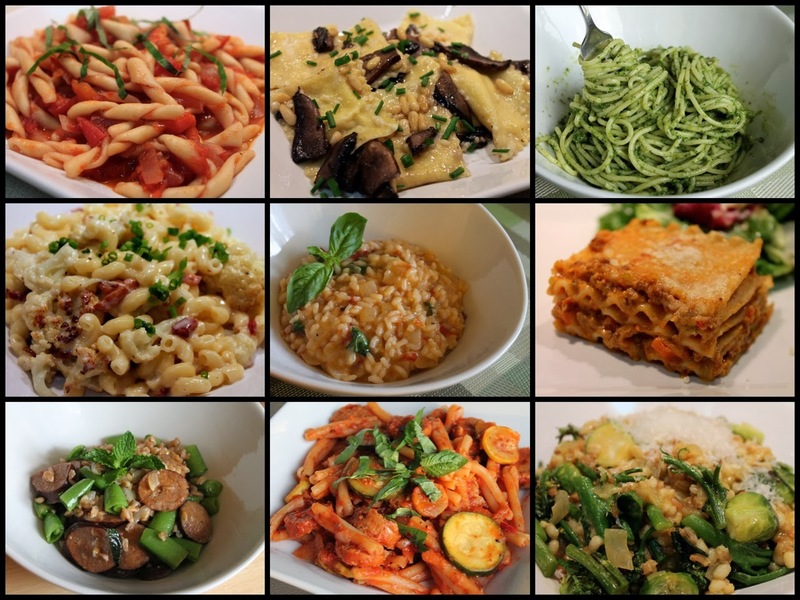 For my favorite pasta and grain recipes, I decided to limit myself to my 10 favorites, which are a great mix of styles, original and adapted recipes and ingredients from all the seasons. 1. Modernist Mac & Cheese with Bacon and Roasted Cauliflower. I adapted this recipe from Modernist Cuisine at Home by Nathan Myhrvold. Their technique for the cheese sauce is so simple and works very well: just water and sodium citrate (the sodium salt of citric acid, available from Amazon). The sauce is amazingly smooth and comes together much faster than the traditional roux-to-béchamel-to-mornay version. 2. Butternut Squash, Goat Cheese and Sausage Lasagna. This alternative to tomato-based lasagna is one of my absolute favorites. It's perfect for fall when squash are in season, which go so well with goat cheese, sage and sausage. 3. Roasted Tomato Risotto. What makes this risotto special is the homemade roasted tomato and fennel broth I made first and used instead of store-bought chicken or vegetable broth for cooking the risotto, which includes additional roasted tomatoes. 4. Pasta with Fresh Tomato Sauce. During the late summer, when tomatoes are in season, we eat massive quantities of them. One of my favorite ways to do so is a simple, quick pasta sauce with fresh basil. 6. Sweet Corn Agnolotti with Mushrooms. Admittedly, recreating Mike Isabella's very popular Graffiato pasta dish is a lot of work. So, if you're in the mood for an intensive cooking project, feel free to tackle this. Despite the effort, the result is a very rewarding dish with amazing sweet corn flavor. 7. Multi-Grain Risotto with Broccolini and Brussels Sprouts. Who says risotto has to be rice? This multi-grain version, adapted from a recipe that appeared in The Washington Post, uses farro, wheat berries and barley. 8. Farro Bowl with Sugar Snap Peas and Kielbasa. Speaking of farro, the quick-cooking whole grain is the perfect base in this summery dish with sugar snap peas, turkey kielbasa and mint. 9. Parsley Pesto Spaghetti. This Bon Appétit recipe is as basic as pasta recipes get, although isn't that often when they're best? The magazine selected my photo among their "Cook the Cover" submissions (mine is #2). 10. Sausage-Zucchini Pasta. Vegan sausage? Normally, I wouldn't be interested. But at a friend's urging, I gave the Field Roast brand a try in this pasta dish and was pleasantly surprised at how well it stood up to the other ingredients in this dish. Honorable mention: Okay, I just can't limit this to 10. And since the Pasta all'Amatriciana snuck in up there at #5 anyway, I'm not going to flinch in also sharing this Mushroom-Bacon Risotto, a perfect late winter dish to warm yourself on a cold night. I can't even ... words don't ... I just ... I mean ... YUM! I want every one of these dishes again.